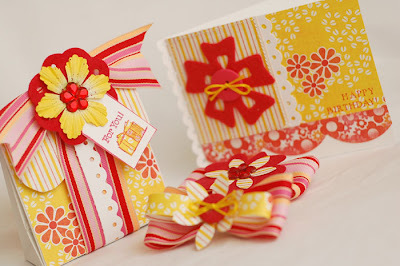 A year ago, my sweet friend Cindy Smith launched Emma's Paperie! What a wonderful year it has been for her. I'm so blessed to be a part of her team. 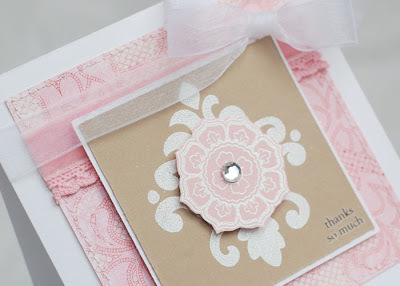 In honor of this special occasion, there is a party going on at the Emma's Blog! Stop by for fun and prizes! Each of us has created a class. 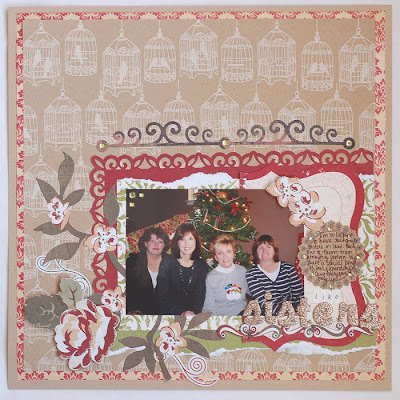 Mine is on using Tattered Angels products. (Glimmer Mist, Glimmer Chips and Glimmer Screens) Here is pne of the the cards that I created. You can check out the blog for details on how I made it. 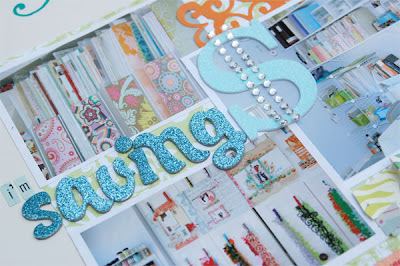 (You may be reading this before she has it up, if so, check back later ;) ) I love the sparkle and shine on here! This week is really flying. I can't believe it is already Wednesday! I finally got around to making my challenge cards for the week. This first one is for 2 Sketches 4 You. It's Laura's sketch. I used my new Jenni Bowlin goodies along with a Melissa Frances glitter star that I spritized with Tiger Lily Glimmer Mist. I just love how this next one turned out. 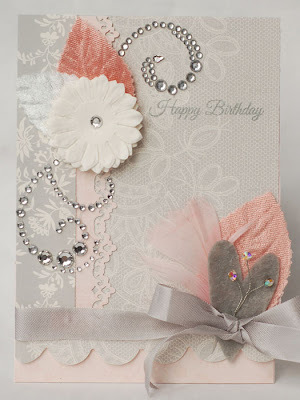 I am definitely a flowery, girly girl when it comes to making cards. (I discovered that this past week as I tried, unsuccessfully to make a masculine card for Emma's...it was really hard!) 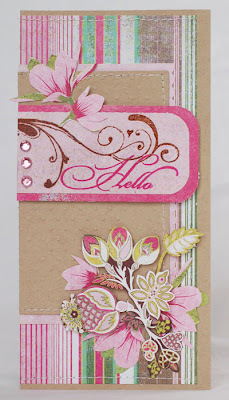 I used BG Sultry paper, and a BG and Close to my Heart stamp. 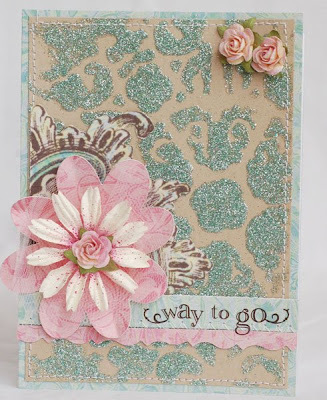 I want to get more into stamping, so I pulled them out for this card this week. 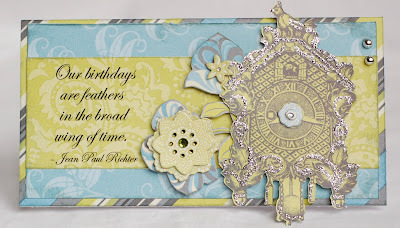 I ran the kraft cardstock through my Revolution using the Swiss Dots cuttlebug embossing folder. I can't get enough of that thing! 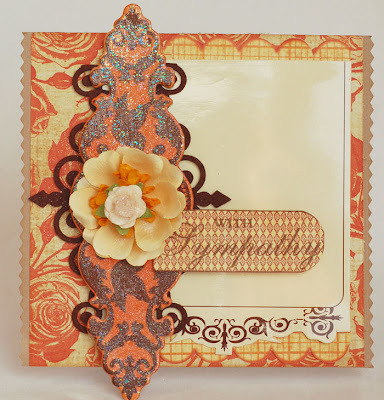 This card is based on both the CPS sketch this week and the Caardvarks challenge to use kraft cardstock on a card. 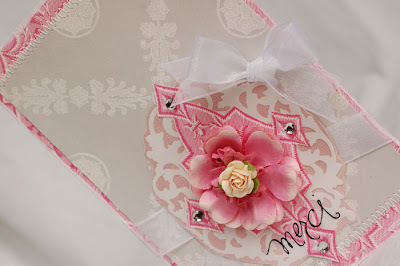 Finally, here is a peek at my post for this week on the MMM blog. 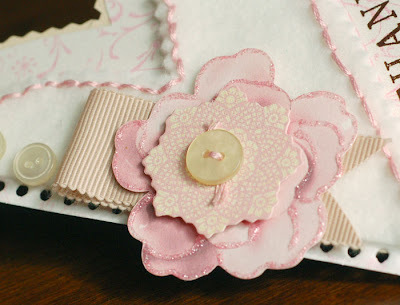 I posted my layout that was in the Memory Maker's March/April issue with close ups and how to's for making embellishments from plastic packaging. You can find it all HERE. I just got back from Odyssey of the Mind practice. The kids have been working really hard on their skit. This is the first time Ryan has done it and he's really enjoying being a part of the group. He's the youngest, so he tends to hang back a bit, but he has a funny part in the play, which involves talking about his favorite topic - monsters - so he's psyched. Are any of your kids involved in OOTM? Heres my project for Emma's from last week. I am in love with this Little Yellow Bicycle line. It's so pretty. 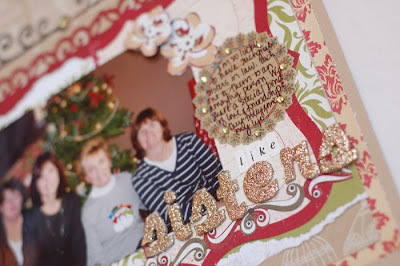 I used the papers, flocked stickers and flocked borders on these projects. 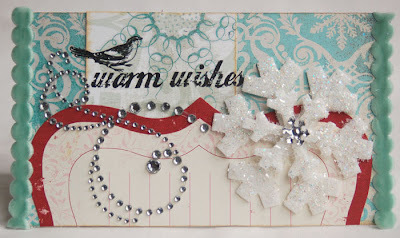 Even though winter will be over soon,(I hope), I'm still enjoying using snowflakes on my projects. I used Basic Grey and Making Memories papers on here. 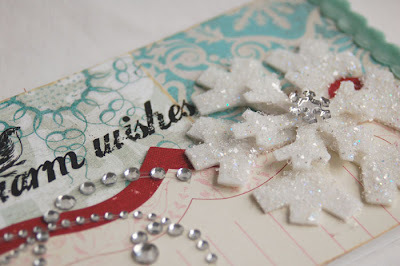 The snowflake is covered with glitter and I added a Prima swirl. LOVE those things! Hope you're having a great weekend. Thanks for stopping by! I wanted to share my card for this week's 2S4Y sketches. The first one is Kazan's sketch. I decided to go fairly simple on this one. 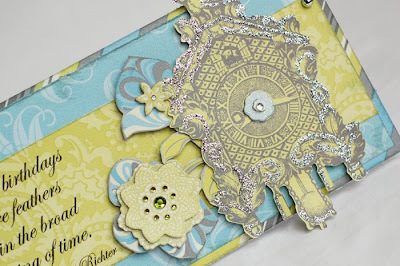 I have been seeing a lot of damask stamping lately and pulled out my KI Memories Damask stamp. 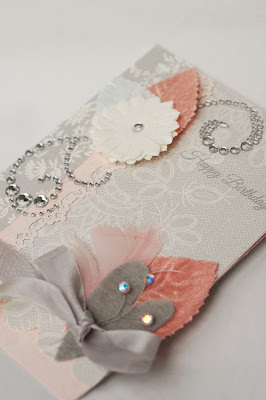 I stamped it onto kraft paper and then heat embossed it with white embossing powder. I love the pop that it gets from the embossing. 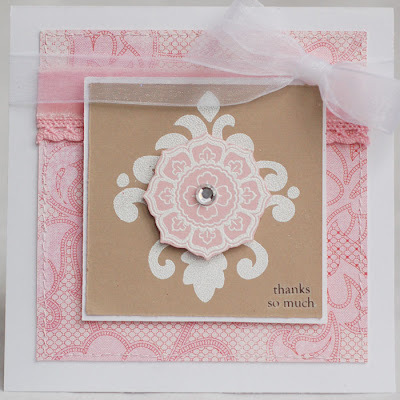 I stamped a Basic Grey flower onto the pink and embossed that, too. 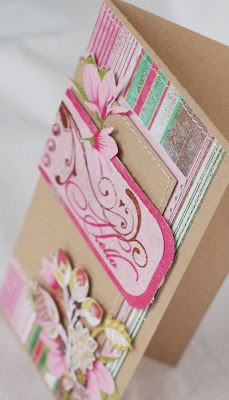 The pink paper is from the MM Lovenotes line. This next one is based on Julie's bonus sketch. 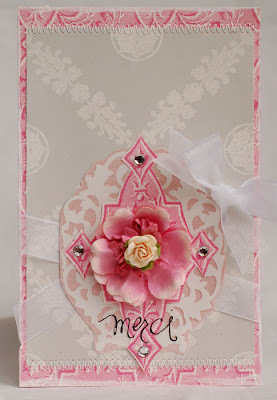 I used K and Company Amy Butler paper and die cuts. I added lots of glitter to the clock. 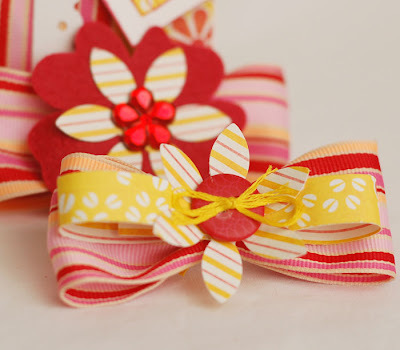 I found that rubon and thought it went perfectly with the theme of the card. 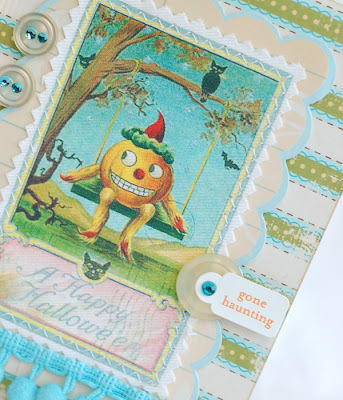 Finally, here is a little Halloween card that I made recently. 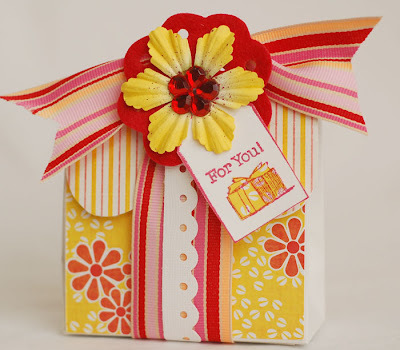 Isnt' that Crafty Secrets cotton scrap adorable??? My online friend Keri Sereika sent it to me a whie back. I think the pumpkin is adorable. I used MM paper and Webster's trim on it. Thanks so much for stopping by. I hope you have a great day! Here are a couple of cards that I've done recently. 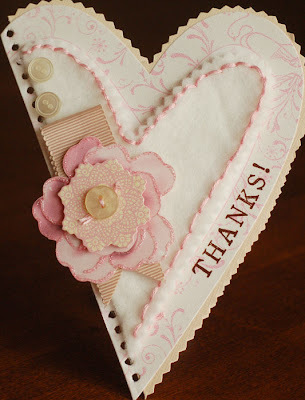 This one is for last week's Cardaclicious challenge to use pink, felt and stitching on a thank you card. 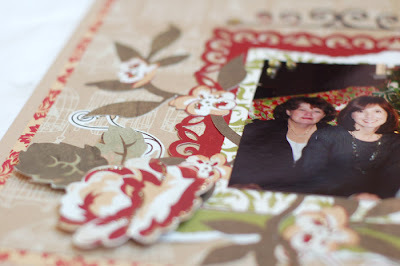 I used a Making Memories Journaling page as the basis of this one. The flower is K and Co. This next one is my CPS card for this week. Well, it's actually a tag. 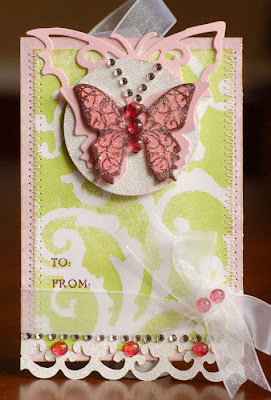 ;) I used a Tattered Angels Glimmer Screen on the white cardstock, sprayed it with Key Lime Glimmer Mist and then topped it with a glimmer chip sprayed with Vintage Pink. 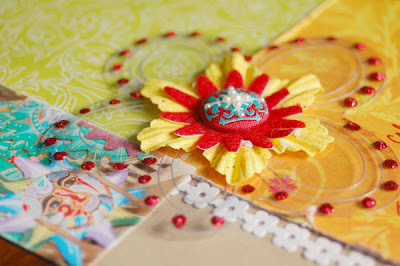 Finally, here is a peek at the page I posted on the MMM blog. Hope you are going to do something fun with the ones you love. We don't do anything fancy, but I do like making a great dinner. Way easier than going out to dinner. Restaurants are CRAZY on VDay! I bought filet mignon and snow crab legs for tonight. MMMMM! And the best part? We're doing chocolate fondue for dessert. (I found my fondue pot when I was reorganizing things last month.) Ryan is so excited for that part. Speaking of my little guy, I looked at him at the dinner table last night and noticed something was askew with his smile. I touched his bottom tooth and, sure enough, it's loose. I almost cried!! I can't believe my baby is going to be losing his first tooth. I don't handle these milestones too well. 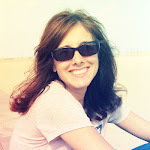 If you read my post from Wed., you know about my car. Well, the good news is I got my make up bag back!! Apparently, when they opened it and saw what it was, they ditched it. My neighbor found it and I got it back. Yay!! So, here's a little something I made for Ryan to give the teacher's aides in his class. I LOVE these little nut cups. They are from HERE. This is one of my favorite Etsy sellers! 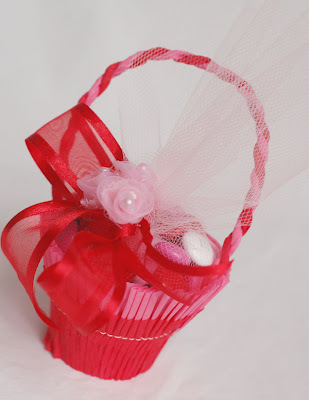 I filled them with some M and Ms wrapped it tulle, added some ribbon and put a couple of flowers on them. Next up is my card for this week's CPS sketch. 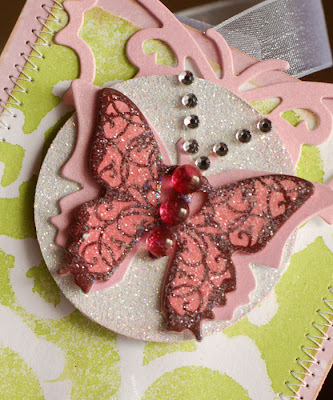 I love all things Tattered Angels and loved using the Glimmer Mist on this Glimmer Chip. 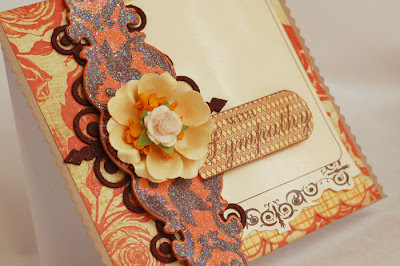 The papers are Sassafrass Lass and the cream paper is packaging from Prima flowers. I'm in love with them these days. Finally, I want to spread the word about a wonderful spot for a retreat. Some of you may know Christine Penaflor. She is one of the sweetest, most talented people I 'know'. 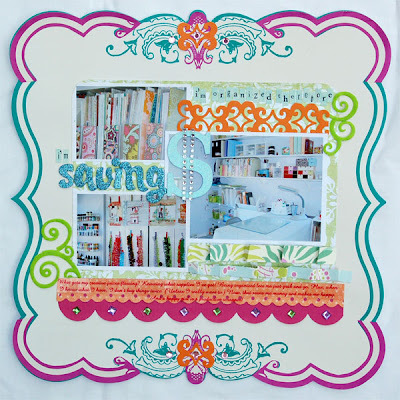 Well, she recently created a great place for scrappers to get together and crop. I'm helping to spread the word. I wish I were closer to head over for a weekend. Unfortunately, California is about as far away from me as you can be. BUT, hopefully some of you can take advantage of this place. Definitely check it out. 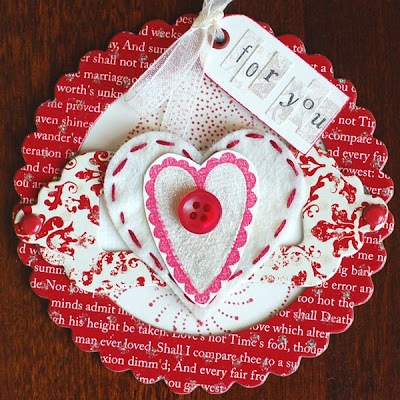 Have a great Valentine's Day! Thanks for stopping by! Sorry it's been longer than usual between posts. I've been creating a lot, just can't share it at the moment. Bummer. I hate that 'unseen' rule that some publications have. It's so hard for me to make something and not be able to post it right away. This morning I had an eye opening experience. I got into my car to head to the mall and realized that someone had been in it last night. The glove box and console were open and the light was on. My GPS and make up bag were gone. I'm so mad. I never thought about my make up as being valuable, but I'd built up a good collection of Bare Escentuals stuff and it will cost a good bit to replace! Goodness knows who would want used make up though. And the clincher is they took my half eaten bag of Good and Plenty!!! I'm waiting for the police to come over and finger print my car. I think the part that really gets me is that we live in, what I thought, is a very safe area. I know this kind of stuff happens everywhere and I always lock my door and car. (I forgot to do it last night, though.) But, still.... Moral of the story? We're not safe anywhere. Protect yourselves. On to happier things. It's in the mid sixties and it's sunny today! Love it! Here are a couple of projects. 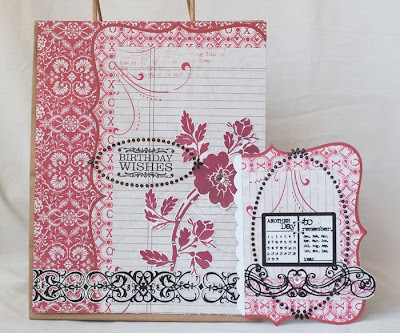 First is the layout I did this week for Emma's. This one is about my sisters in law. I never had a sister growing up, so I'm just blessed to have these three wonderful ladies in my life. They are three of the most truly good people I've ever known and I love them dearly. 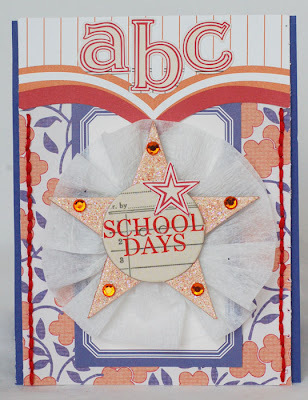 I used some Hambly, MM and Jenni Bowlin papers and lots of Basic Grey stickers. This next card is for the 2 Sketches 4 You sketch this week. 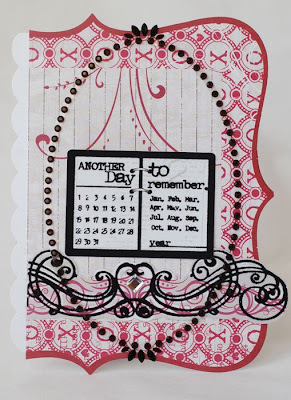 I used my Jenni Bowlin Feb. kit again. I love these Anna Griffin papers. The flowers are Prima and the transparency is Hambly. I've really been getting hooked on digital designs! I love perusing digital galleries and the kits are so beautiful. Just what I need, right? Another obsession. Anyway, here is a layout I made the other day. I love these pics of Ryan. We were at the shore with all of the cousins and we were taking photos on the beach. The kids were having a blast jumping off of this little stand that rents chairs and umbrellas. I got Ryan to stand still long enough to get a couple of good shots. 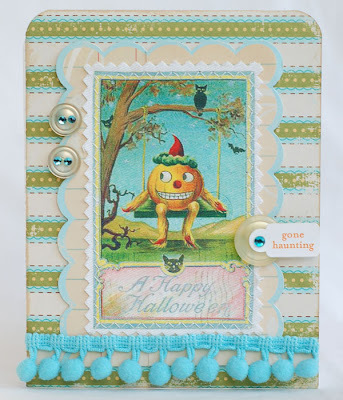 I used a kit called Summer Evenings by Catherine Designs at After 5 Designs. Just looking at it has me craving the warm sunshine and sound of the sea gulls! I can't wait for summer. I'm such a beach bum! 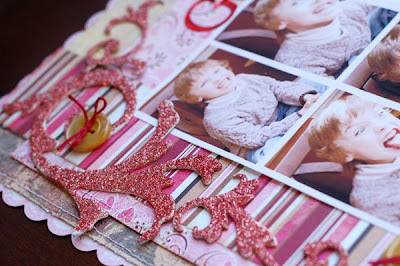 This next project is the one I did for Emma's this week. I had to use the little box and create something with it. I decided to do a barette set for my friend's daughter. I had made one for her sister and she asked for one, too. This is what I came up with. 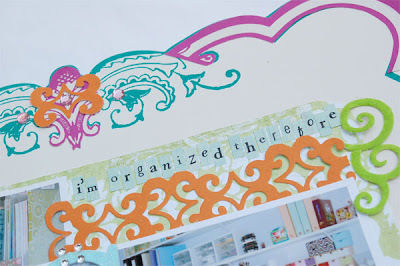 I love this Sassafrass paper!!! Well, that's it for today. Hope you have a great day! Thanks so much for stopping by! It can't seem to figure out what it wants to do today. I woke up to snow. Then there was sun. Now, we're back to snow showers. Oh, well. It's nice and cozy inside and that's all that matters! First up, this week's 2 Sketches for You card. I love these sketches. I've been itching to play with my Jenni Bowlin kit and was finally able to do so this morning. I love all of the goodies that are in it. I added the Prima gems,b ut everything else came with the kit. 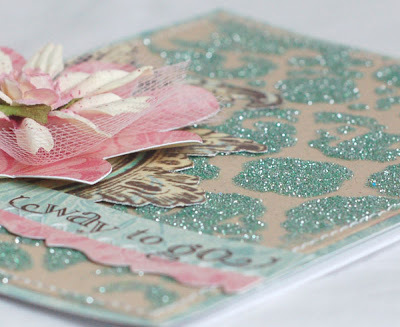 (except the stamp...) There's so much texture to this card, I can't wait to give it away! 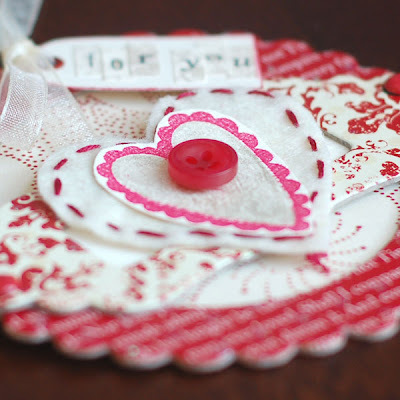 This next project is a little Valentine's Day tag. It was in Cards last year. That Making Memories Love Story line has to be one of my all time favorites. The heart stamp is Kim Hughes'. My room already looks so different from those photos. I can't wait until it's done so I can post pics. 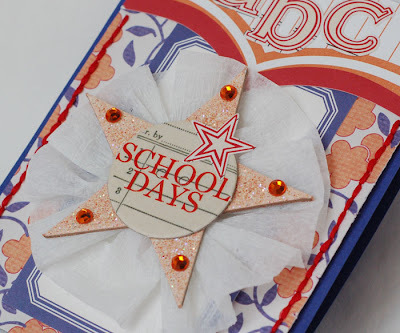 Speaking of MM, today is my day on the blog. I posted the Valentine's Day card I'm sending out. I never got around to Christmas ones! You can see it here.